Sayeed Muhammad: Noted Dhaliwood actor Ilias Kanchan, under the banner of his organisation Nirapad Sharak Chai, formed a human chain in front of National Press Club in Dhaka yesterday morning. The human chain formed round 11am came in the wake of the ongoing protests for safe roads, and to demand justice for the two students killed in a road accident on Airport Road recently, reports the Dhaka Tribune. The actor was scheduled to leave for London, but postponed his plans when the protests began on Sunday. 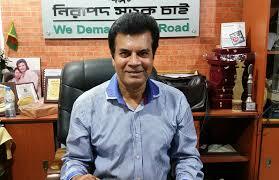 He felt his long-desired dream of a complete system overhaul of Bangladesh’s road-transport system, is finally close to become a reality.His wife, Jahanara Kanchan, was killed in a road accident in 1993 and since then, Ilias Kanchan has been a road-safety activist and started the organisation, Nirapad Sharak Chai, with currently has 120 branches across the country.“Since I started this movement, I have faced a lot of harassment. Now, 25 years later, Bangladeshi students have come out on the streets realizing that if they do not protest, they might lose their lives because of these unsafe roads,” Kanchan said.